A chair, is just a chair, right? Wrong. If you want to upscale and take interior design seriously, your living space shouldn’t be just a sofa, or as your parents might describe as 'a three-piece-suite' (a description which makes me shudder at how old fashioned it sounds), it can be so much more. Modern homes who want to transcend and embrace great style now have what we like to call a 'statement chair'. These can be stand-alone or come in pairs, what they have in common though, is the impact they have on focusing the eye within your space. Simply throwing a large cushion or changing the covers on a chair may be a cheap and easy way to do this, but there are other factors you need to consider when buying one for your home. Not all of us can afford a classic Eames chair, but more importantly, not all of us have space in our homes to house one. Vintage or new, the aesthetics and dimensions of your statement chair are important considerations. Showrooms and department stores can be deceptive, as something that has been able to shine and look fantastic on the shop floor could look cramped and out of place in your house, and a classic Mid-Century piece may make the rest of your furniture look cheap and ugly. Try finding small details like the material or colour to connect your chair to your room, as you don't want it to look out of place. Statement furniture should say "this has finally found it's home", rather than, "we're borrowing this from someone temporarily until we can find something much nicer." You might be mistaken in thinking a statement chair needs to be loud and proud. I'm all for standing out, but there is a fine line between complementing your interior and clashing wildly with it. I wouldn't put a chintz-covered rocking chair in an innercity bachelor apartment like our Bankside project for example. If you go for a bold colour or pattern, try to find something in the design of your chair which will link it back to your interior design of the room where it will live. This could be tiny colour detail, the metal fixture material on the legs, or the design period the piece is from. Be brave with your choices but just make sure it's tasteful too. Chairs aren't just designed to be sat in. The tactile nature of the material also plays a part in how you emotionally respond to an item of furniture. Wood implies character, age, sturdiness - perfect for practical areas of your home. Wool reminds me of the countryside and going back to nature, comforting vibes perfect for relaxing living areas and bedrooms. Chairs in leather can be masculine and hardy, lending themselves well for an office or study. Unexpected fabrics like velvet, plastic and wire can suggest a playful element to your home. Comfort is key, if you don't like sitting on a chair, you're probably never going to use it. Another factor to consider is how are you going to use your statement chair in your home. Formal spaces only require temporary seating so can be quite decorative and upright. 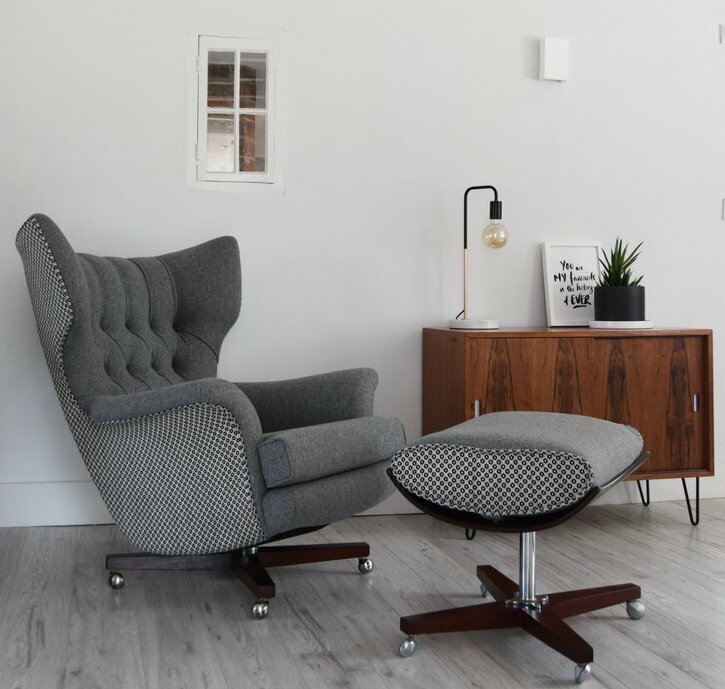 A chair which is used to escape and chill out on needs to be soft with a lower back, wide enough for you to recline and maybe curl up with a good book. Don't be fooled into buying something that looks dramatic yet feels like its made of Lego. This is the only danger of online purchases, so make sure you can check out any furniture in person if you can. Do you have space for a statement chair, could you have a matching pair? There's nothing sadder than a great piece of furniture which looks great but never gets used as it's in the wrong place. Ensure you create an environment which invites people to use it regularly, rather than let it be ignored as though it's in the way like some ornament. If it's a reading chair, set up a neighbouring bookshelf. If it's a smoking chair or highback chair, why not face it away from the television, so it encourages you to use it differently. Most importantly, if you can afford to, try to invest in a quality piece of furniture. A statement chair is a reflection of your personality and whilst it resides in your home, how you use it will ultimately become a part of its history. And for me, this is the special part of buying furniture, as nowadays we're surrounded by so much cheap, disposable furniture which only last a decade or so. Finding a quality piece which speaks to us ensures it lives on and potentially becomes a valuable heirloom for your family, providing joy to generations to come.